Photo paper is the perfect add-on for any printing enthusiast. Whether you're after bright, vivid photo's, in which case you should check out our best selling glossy packs, or just want some cheap photo paper to print some holiday snaps on, we have you covered. We stock all major manufacturer photo paper in addition to fantastic budget options. HP, Epson and Canon dominate the photo paper world, and their papers all have unique ranges and names which can be a bit misleading. Below are all the details you'll need to make an informed decision of what photo paper is best for you. HP Everyday photo paper is made from recycled materials and is perfect for... well.... everyday printing. Whilst the printouts will last, there is no true focus on longevity, but the print quality will still be great. Perfect if: You don't want to spend too much, you have lots to print and will replace them within 2 years. HP Advanced Photo Paper has more of a focus on quality and long-lasting prints. With a real focus on longevity and unbeatable print quality, the A4, 10x15 and 6x4 HP Advanced photo paper is meant for those prints you really want to treasure and show off. Perfect if: You want your photos to last and you don't mind paying for it. 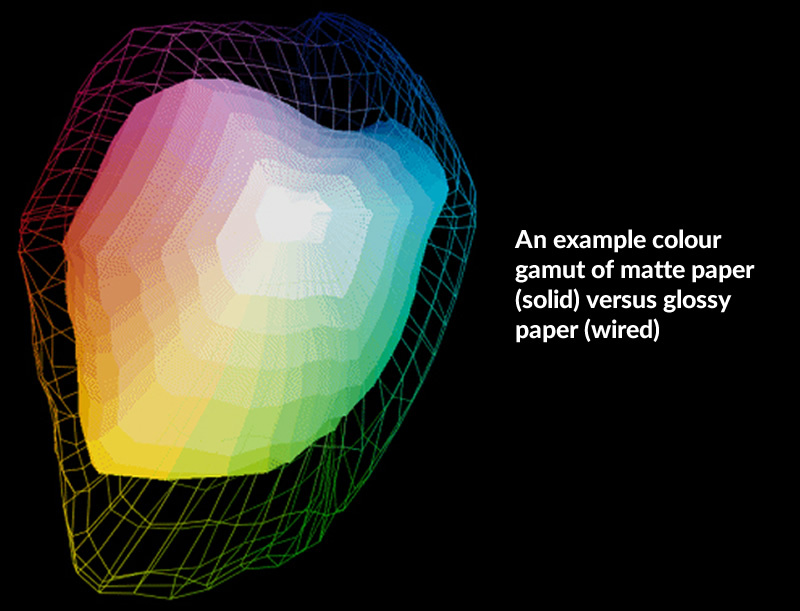 Epson photo paper is their "alternative paper for price-concious hobbyists". This basic photo paper still gives great glossy photo results, but they're not designed for long archival life. Epson Premium photo paper is their more expensive option for keen photo printing enthusiasts that wants their photos to last. 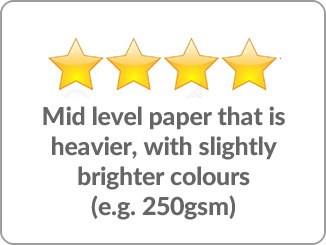 With the best colour matching, brightness and archival time, this paper is more expensive but worth every penny. 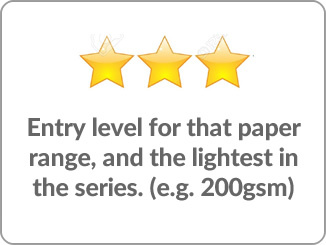 Each of the Epson paper ranges has a star grading system to allow quick comparing between packs. 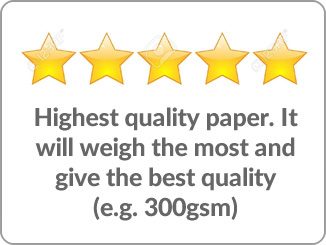 You want to mix the benefits of both paper types. Semi-gloss gives you the higher colour gamut and brightness of glossy prints, with slightly less reflection so it is ideal for display. It's basically the jack-of-all-trades photo paper option. Canon Everyday GP-501 photo paper is the economical way to print photos. If you're after good value photos that will last a decent amount of time without breaking the bank. Canon Plus PP-201 photo paper has more of a focus on quality and long-lasting prints. This is the paper for you if you're a keen photographer or image enthusiast that want the best prints. Canon Matte MP-101 photo paper is Canon's matte paper option for anyone needing prints that don't reflect light. It's tailor made to work with their inks and prints brighter-than-normal Matte photos. Canon Plus Semi-Gloss SG-201 photo paper is a satin finish paper that gives results as good as the PP-201 plus paper but with a softer, less-reflective finish. The remaining Canon papers are for niche demands, and if you're shopping for them you likely already know what you want and what you need! Well wrapped and quick delivery. Photo paper yet to be used but have used this product in the past with good results. As always, my Stinyink order was delivered promptly after a simple on line ordering process. Haven't used the photopaper yet but have used the 6x4 paper previously on my Canon MG6450 with great results. Great service. The only A4 paper I'll use in my Epson printer for my artwork! Also can't believe how fast the delivery was, Stinky Ink have never disappointed me. Very speedy service. Best online price. Product exactly as advertised. Therefore no complaints. Would definitely recommend this supplier. Arrived when expected and well packaged as usual. Great paper, always use this as the photo is always excellent, can't fault it. The Photo paper is excellent and the service was great, ordered one day and delivered the next day!!! You want bright, vivid photo prints and the highest print quality. Glossy paper is durable and perfect for handing around your snaps to friends and family. You can literally wipe the paper clean. It's highly reflective though, so not great for bright rooms with multiple light sources. You will be displaying your images in bright, well lit rooms, and are not planning to put your prints in a frame or cover. Matte paper does not have as large a colour gamut as glossy, so you'll notice some difference in the quality up close, but with minimal reflections it's perfect for well lit areas. You want to mix the benefits of both paper types. Semi-gloss gives you the higher colour gamut and brightness of glossy prints, with slightly less reflection so it is ideal for display. It's the jack-of-all-trades photo paper option.